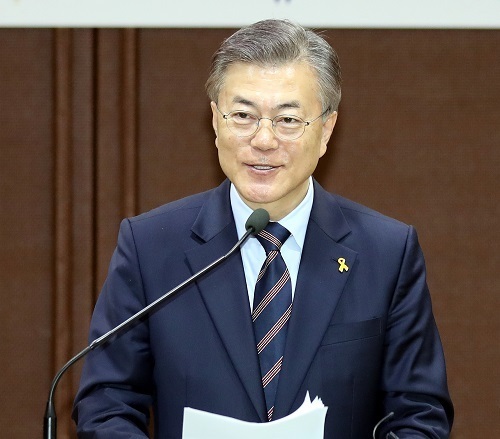 Presidential front-runner Moon Jae-in widened his lead in a new opinion poll released Friday as runner-up Ahn Cheol-soo's numbers plummeted. Moon, a former leader of the liberal Democratic Party, garnered an approval rating of 41 percent, up 1 percentage point from last week, while Ahn, co-founder of the center-left People's Party, declined 7 points to 30 percent, according to Gallup Korea. Hong Joon-pyo of the conservative Liberty Korea Party came in a distant third at 9 percent, followed by Sim Sang-jeung of the progressive Justice Party at 4 percent and Yoo Seong-min of the splinter conservative Bareun Party at 3 percent. "It appears that a portion of voters who backed Ahn abandoned him amid the intensified vetting and negative campaigning following the launch of the official campaign period (on Monday)," the pollster said. Before the survey results were announced, some political commentators attributed the decline in Ahn's support to his comparatively poor delivery in the first presidential debate last week. Hong, meanwhile, gained 2 points after receiving the most support (26 percent) out of all candidates in the conservative stronghold of Daegu and North Gyeongsang Province. The firebrand politician has recently sought to rally the conservative vote on the back of regional tensions caused by North Korea's threats to conduct another missile or nuclear test. In the same region, Ahn's rating more than halved from 48 percent to 23 percent. Moon's higher rating was largely driven by increases in the swing region of Daejeon, Sejong and Chungcheong, and the liberal stronghold of Gwangju and Jeolla. The top reason for supporting Moon was voters' desire for a change of government and removal of deep-rooted evils, while for Ahn, it was his new and original image. Hong's supporters cited his policy on North Korea and national security, Sim's supporters chose her policies and election pledges, and Yoo's supporters picked his principles and convictions. On whether they will continue to support their favored contender ahead of the May 9 election, 64 percent responded affirmatively while 34 percent said they could change their minds.